Genuine 14k gold extender for chains and necklacesAdds extra length up to 3 inches.Includes jump ring and lobster lock clasp.All items come with a gift box.Properly stamped and marked.Pictures are enlarged to show details. 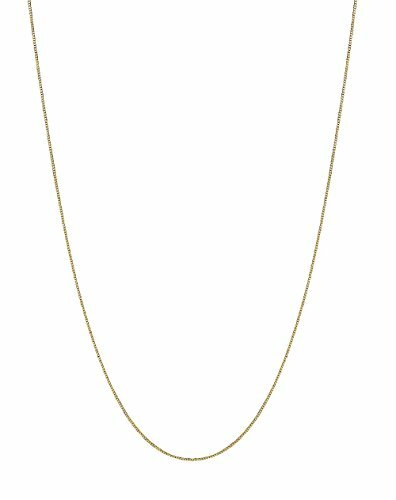 Genuine 14k Solid Gold Box Chain Necklace This is a delicate and dainty chain and must be handled with care.Available in yellow-gold, white-gold, or rose-gold (18 inch only)Available Lengths: 16", 18", 20" and 24" Lobster claw lock clasp for comfort and security when worn. Beautifully designed and well crafted. This jewelry will make a great accessory and compliment any style and occasion. All items come with gift box Properly marked and stamped PICTURE IS ENLARGED FOR DETAILING. Your Satisfaction is important to us! If you are unsatisfied with your purchase, for any reason, you may return the item for a FULL REFUND within 30 days of purchase. 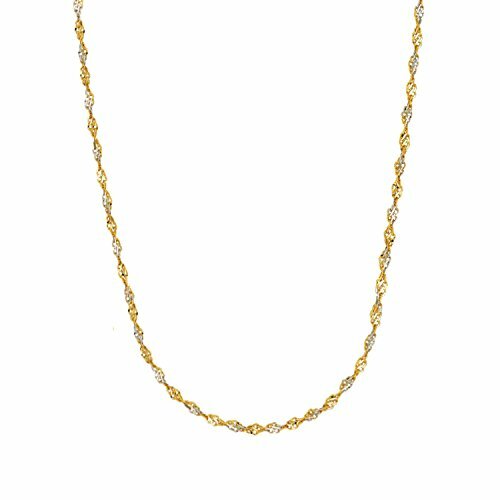 14K Yellow Gold Singapore Chain Necklace. Spring lock for comfort and security. 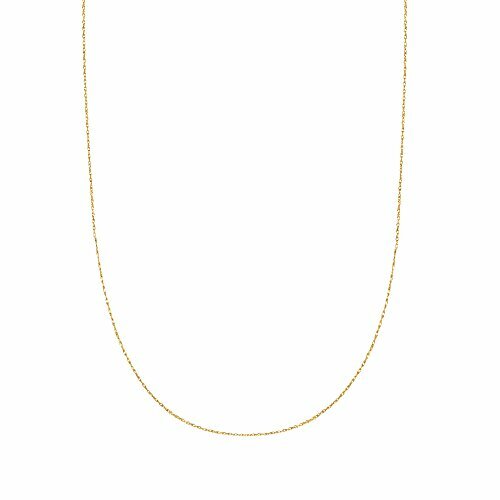 This Chain necklace has a diamond cut finish. It features a gently twisting design. Beautifully designed and well crafted. This jewelry will make a great accessory and compliment any style and occasion. All items come with gift box Properly marked and stamped PICTURE IS ENLARGED FOR DETAILING. 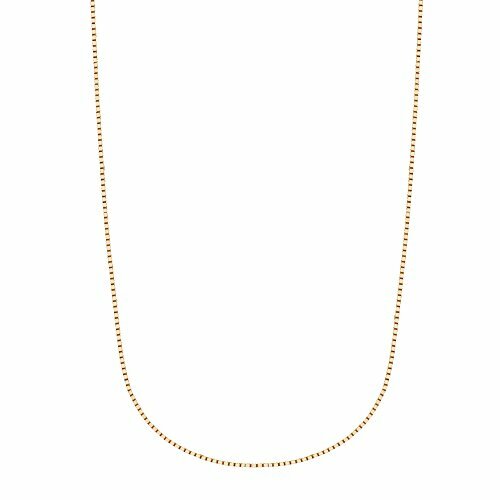 Genuine 14k Solid Gold Box Chain Necklace This is a delicate and dainty chain and must be handled with care.Available in yellow-gold, white-gold, or rose-goldAvailable Lengths: 13" (yellow-gold or white-gold only), 16", 18", 20" and 24" Spring ring lock clasp for comfort and security when worn. Beautifully designed and well crafted. This jewelry will make a great accessory and compliment any style and occasion. All items come with gift box Properly marked and stamped PICTURE IS ENLARGED FOR DETAILING. Your Satisfaction is important to us! If you are unsatisfied with your purchase, for any reason, you may return the item for a FULL REFUND within 30 days of purchase. 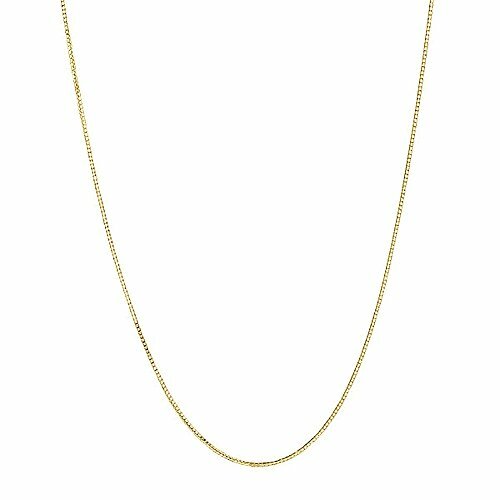 14K solid gold Box chain .7mm width. 13" length is suitable for children or petite's. Nice and sturdy. Lobster Lock for comfort and security. Beautifully designed and well crafted. This jewelry will make a great accessory and compliment any style and occasion. All items come with gift box Properly marked and stamped PICTURE IS ENLARGED FOR DETAILING. Your Satisfaction is important to us! If you are unsatisfied with your purchase, for any reason, you may return the item for a FULL REFUND within 30 days of purchase. 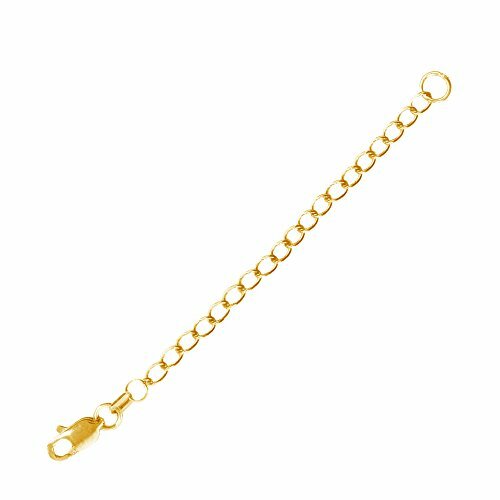 10K Solid Yellow Gold Mariner Link Chain 1.2mm in Width. Flat mariner chain with concave design stays flat when worn. Spring clasp lock for comfort and security. Beautifully designed and well crafted. Chain is light, delicate and dainty Must be handle with utmost care. This jewelry will make a great accessory and compliment any style and occasion. All items come with gift box Properly marked and stamped PICTURE IS ENLARGED FOR DETAILING. Your Satisfaction is important to us! If you are unsatisfied with your purchase, for any reason, you may return the item for a FULL REFUND within 30 days of purchase. 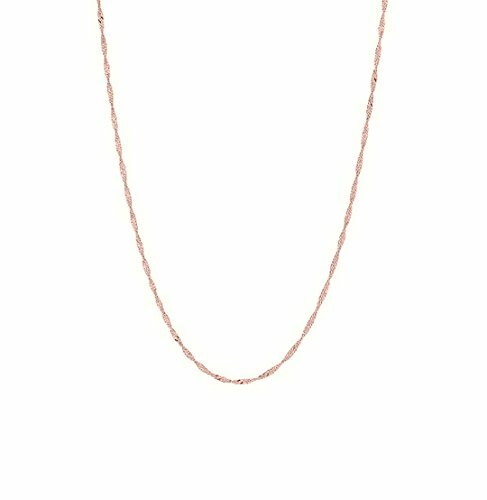 14K Real Pink Rose Gold Singapore Chain Necklace. Spring lock for comfort and security. Fine and delicate gold chain. 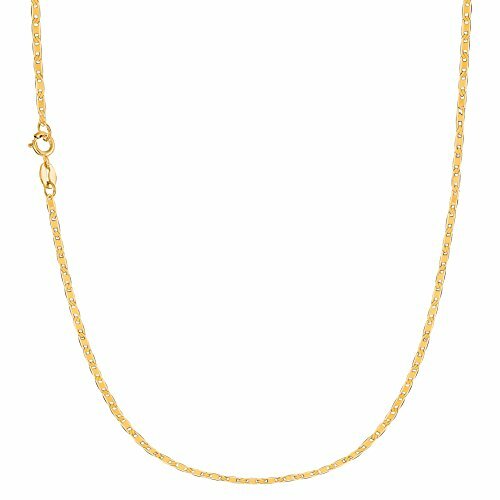 This Chain necklace has a diamond cut finish. It features a gently twisting design. Beautifully designed and well crafted. This jewelry will make a great accessory and compliment any style and occasion. All items come with gift box Properly marked and stamped PICTURE IS ENLARGED FOR DETAILING. This 10k classic Box Chain made by Italian machinery is an all time favorite. This is a soft, supple and lite, 0.45mm wide chain. Suitable for lite pendants. Includes a spring ring clasp to uphold strength and comfort. Beautifully designed and well crafted. This jewelry will make a great accessory and compliment any style and occasion. All items come with gift box Properly marked and stamped PICTURE IS ENLARGED FOR DETAILING. Your Satisfaction is important to us! If you are unsatisfied with your purchase, for any reason, you may return the item for a FULL REFUND within 30 days of purchase. 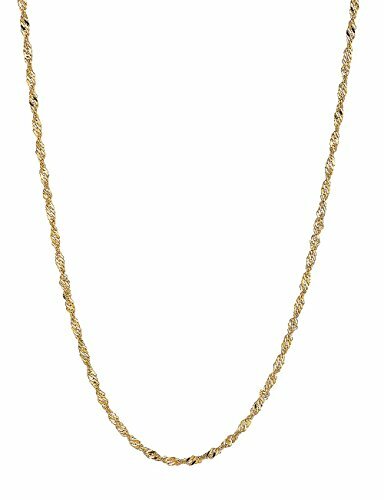 Genuine 14k Gold lite rope pendant chain necklaceBeautifully crafted and well designed. Great for light pendantsAvailable in Yellow Gold or White GoldAvailable Lengths: 16" 18" 20", and 22" in both Yellow-Gold and White-Gold Chain Width: 0.60mm thickSpring-ring lock clasp for comfort and security when worn.All items come with a gift box.Properly stamped and marked.Pictures are enlarged to show details. Compare prices on Ritastephens Gold Chain at ShoppinGent.com – use promo codes and coupons for best offers and deals. Start smart buying with ShoppinGent.com right now and choose your golden price on every purchase.